Thank you! Beautiful translation. Yuzu is so thoughtful and genuine. He just inspires! I think he is blood type B. Thank you for this beautiful post! I am amazed! I just looked at the jumps and it looked a little weird. I forgot to consider bonus! 4S has a higher base value than a 4T. Just by a bit. Thank you for replying. It is good to know. Someone was criticizing his costumes on Youtube and blamed Johnny Weir. I began to wonder. I love his costumes this season! Anybody know who is designing Yuzu's costumes? Is Johnny Weir still involved? 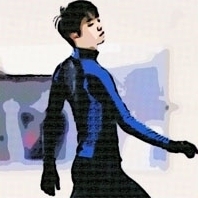 Who designed his LGC costumes? LOVE THESE!! So adorable! I do not know if the media is trustworthy. Your google translate is not wrong. Either the journalist or Javi made a mistake. I can not recall. But I think some commentators jumped to conclusions about Shoma being National Champion. They probably thought Yuzuru lost to him. The journalist may have made a similar mistake or misquoted Javi. Then again, it might be possible that Javi is a little confused. The new banner looks beautiful! Thank you for all the hard work!